The Law of Unintended Consequences SCORES! Facebook has long been the king of social media, because of how easy it is to project the element of personality and fun which fits so excellently into its format. Social media itself is undeniably powerful. According to a recent study by AOLplatforms, the social media phenomenon has emerged as one of the most popular marketing tools to reach consumers. But Facebook is not alone in this field, Twitter, Pinterest, Instagram, LinkedIn, YouTube, etc. are all viable options and are making a difference. Someone should tell Facebook. A recent ADWEEK article by Michelle Castillo reported that companies “are pulling away from Facebook in “dramatic numbers”—reallocating their resources to microsites and alternate social channels like LinkedIn—after the agency’s social media managers saw a “dramatic dip” in reach for their messaging over the last 16 months.” Why the drop? Facebook itself. The ever-changing Facebook EdgeRank algorithm has virtually eliminated the impact of true “organic” likes and shares. Unless posts are paid for, they may simply not appear. It’s hard to like or share something you can’t see. And even if you pay for your posts to be seen, you still don’t own the data. Hence brands are abandoning Facebook in favor of blogs, blogger networks; sites such as LinkedIn, and by creating their own microsites. 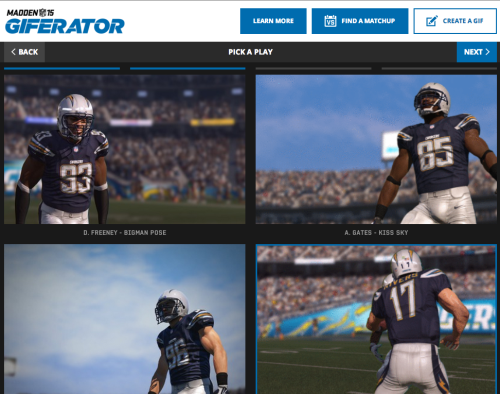 The microsite Michelle Castillo highlighted, to promote EA Sports latest Madden NFL 15 game, is The Giferator, which allows people to customize trash-talking, shareable GIFs. It only used Facebook, along with other social media, to drive traffic to its microsite. The site had less unique visitors than Facebook, but those unique visitors remained on the site for an average of six minutes, and that resulted in a treasure trove of game fans’ data. Good for Madden. Good for creative advertising. Good for fans. Bad for Facebook. Facebook’s virtual elimination of organic response was supposed to make its advertising unavoidable and invaluable. Instead it is magnifying the value of all other social media options, while simultaneously leading to new and innovative options that never existed before.